English, with a New York attitude! Join us, Saturday April 22nd, at the Queen Elizabeth II Garden in Lower Manhattan 1-4pm for this family friendly event. 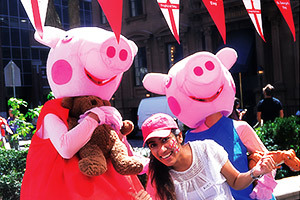 Weatherby-Pembridge School will be providing a kid's activation with face painting, balloon modelling and a special appearance from Peppa & George Pig. Older kids can test their rugby skills and there will be food and music too. Come to the Block Party and enter our BritBox inspired costume competition and dress as an iconic English TV character for the chance to win a trip for two to England on Virgin Atlantic. You can also dress your dog in English costume for the chance to win other prizes. Play our England Pub Explorer Challenge from April 20th-23rd for the chance to win prizes. Simply download the ‘Mobile Adventure’app from the App or Play store then enter 842725298273 to play..
Also visit one of our Official England Day Headquarters Pubs on Sunday April 23rd to enjoy an Old Speckled Hen. 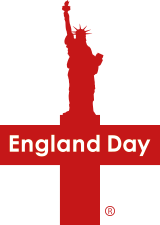 Wear red and white or English costume for the chance to win a Limited Edition T-shirt, while stocks last. For all the priority event listings, updates and reminders and information about more ways to get involved, register your email here. Get involved and stay up to date with event news and all things English in New York by joining our Facebook community. "We'll be there to raise a pint to St George and all things English." "As a proud U.S. Citizen I'm excited to celebrate my English heritage." with a New York attitude!